All Water bottle labels are Waterproof, self-stick and glossy and come personalized with your text and colors. These are actual labels that you will receive from us, not a printable file. Labels are made in the USA. 6. Enter any special instructions you would like us to know. A proof will be emailed to you prior to printing for your review within 1 business day of your order. The proofing process allows you to make changes or alterations to your custom product prior to printing. Please ensure you check your Etsy messaging and/or email for your proof. Can I Add My Photo To This Label ? 2. We can always accommodate a last minute order, simply place the order and message us that this is a rush order! 4. We do NOT charge Rush Fees. Your order will arrive exactly as ordered. The colors you see here on your screen are close but not exact. Color reproduction is limited by various situations beyond our control such as the hue/contrast settings on your monitor. Our goal is to exceed your expectations. 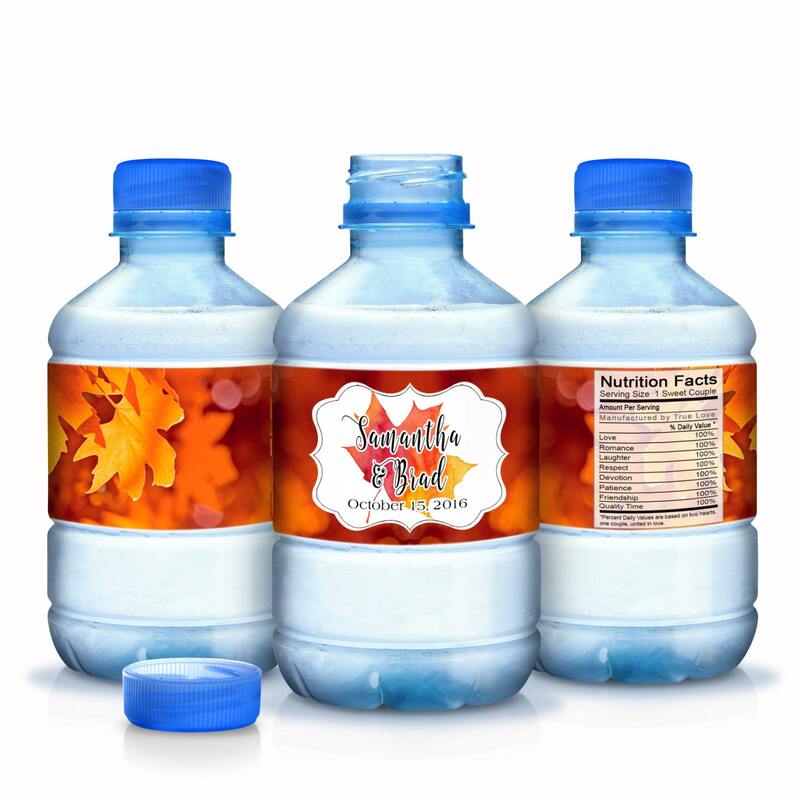 Great Little Favor Co guarantees that your personalized water bottle labels will be created as you've requested, and that your purchase will arrive to you in excellent condition for your event. , If you’re dissatisfied with your order for any reason, we will work together with you to make your order right. We have a full time team online to assist you with any ordering questions you may have and have been in business for over 25 years. When looking for a water bottle for your labels to fit your labels we recommend taking a regular piece of paper with you to the store folded either 7 1/2", 8", or 8.18" across. If the paper wraps securely around the bottle, our labels will fit that bottle. These are a few that we've tried that fit securely with adequate overlap around the bottles. Please note that different regions sell different brands of water so its very important to measure the bottles to ensure your labels will fit securely around the bottle.